Netflix(L-R) Albuquerque mayor Tim Keller, governor Susana Martinez, and Netflix VP of physical production Ty Warren announcing the planed purchase of ABQ Studios. Netflix announced it’s in final negotiations to purchase production hub ABQ Studios in Albuquerque, New Mexico to produce its upcoming movies and TV shows. The streaming giant plans to bring $US1 billion in production to New Mexico over the next 10 years and create up to 1,000 production jobs a year. Netflix wants Albuquerque, New Mexico to be the main location for its content-making. The streaming giant announced on Monday that it has chosen ABQ Studios, located in Albuquerque’s Mesa Del Sol, as the site of the new US production hub for its huge roster of TV shows and movies. This marks Netflix’s first purchase of a studio complex. 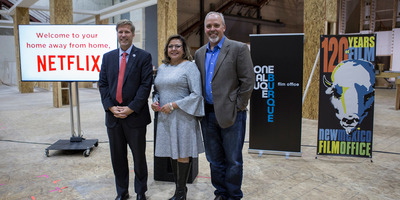 New Mexico Governor Susana Martinez, Albuquerque Mayor Tim Keller, and Netflix VP of Physical Production Ty Warren were on hand to make the announcement, which is in final negotiations. According to a release about the purchase, Netflix plans to bring $US1 billion in production to New Mexico over the next 10 years and create up to 1,000 production jobs a year.